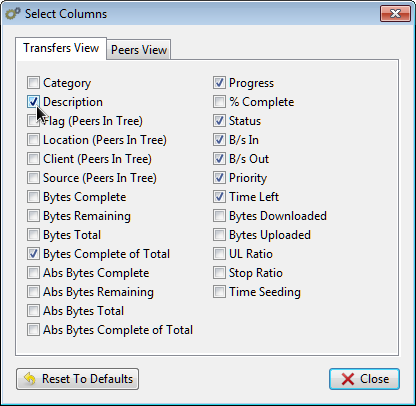 This feature helps organize transfers by adding a user-defined description. Combined with the Text Filter bar (also available in the Layout menu), transfers can be organized and located using descriptive terms or tags. To enable this feature, click the Layout button in the top-right corner of the main Transfers View. Choose the "Select Columns..." option. 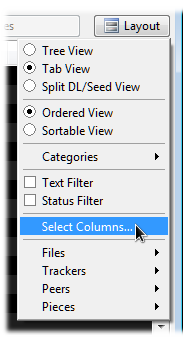 The column selection window will appear. Check the description column and click the close button to dismiss the window. Now right-click any transfer (or select multiple transfers using the shift and/or ctrl keys) and select Description from the popup menu. The Edit Description window will appear. Type in an appropriate description and click OK.
To filter the main view by descriptions, activate the Text Filter feature in the Layout menu. Once the filter bar appears at the top of the main transfers view, you should make it apply to descriptions by clicking the option button on the far right and checking the Description item on the popup menu. 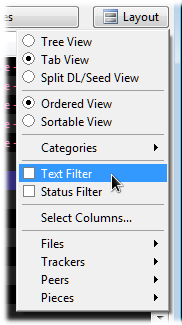 Now type some text into the filter bar. Only transfers containing the text in the name or description will be shown in the main view.